Missouri : Close to Home. Far from ordinary. Johnny loved his lager like a sailor loves his grog. You should have heard him cry. In 1803, Thomas Jefferson made the largest land grab in United States history when he completed the Louisiana Purchase. Part of that acquisition was a block of land that is now the state of Missouri. Known as the Gateway to the West, Missouri, was the starting point for western exploration, including the Louis and Clark Expedition. Eighteen years after the Louisiana Purchase, Missouri would become the 24th state, and this week’s featured state. In the early 1930s, a St. Louis lawyer named Luther Ely Smith, wanting to commemorate St. Louis’ role in westward expansion, pitched an idea for a memorial. Over the course of the next 30 years, The Gateway Arch would come to fruition, and in the process become the largest man-made monument in the United States. Located on the west bank of the Mississippi River, which played a critical role in western expansion, The Gateway Arch also has a physical connection to American brewing history. In 1838, a German immigrant, Johann Adam Lemp came to St. Louis and opened a grocery store. In addition to groceries, Lemp, a master brewer back in Germany, sold his own brewed beer and vinegar. It wasn’t long before beer became his primary product, and in 1840, the Lemp Brewery was established. Starting out brewing ales, the brewery soon took advantage of the natural caves around St. Louis perfect for lagering, and became the first commercial lager brewer in the country. St. Louis is also know for another national brewer, Anheuser-Busch. Started about a decade after Lemp, Anheuser-Busch quickly grew through multiple acquisitions and various price fixing schemes. And it wouldn’t take long for this fast growing brewery to eclipse Lemp Brewery. However Lemp and Anheuser-Busch remained the most prominent brewers in the state for a few decades, producing a majority of the 61 million gallons of beer brewed in St. Louis in 1892. The Lemp Brewing Company would not survive prohibition, and by the 1960s, Anheuser-Busch would become one of the few operating breweries in the United States. But the Lemp brewing legacy will always live on in Missouri, as part of the land acquired for building the Arch was also the site of the original Lemp brewery. While Anheuser-Busch would continue to dominate the St. Louis beer scene throughout the 60s and 70s, during the 1980s American would start to see a new growth in the beer industry. One of those new companies looking to reintroduce flavorful beer to the country is Boulevard Brewing Company. Founded in 1989, Boulevard has grown from its original business plan of 6000 barrels a year to a current 600,000 barrels a year. This week, we will be sampling a very small portion of those 600k barrels in the form of 5 different and interesting styles. Boulevard is not the only brewery operating in Missouri today, but they are the only brewery I have easy access to here in New England. 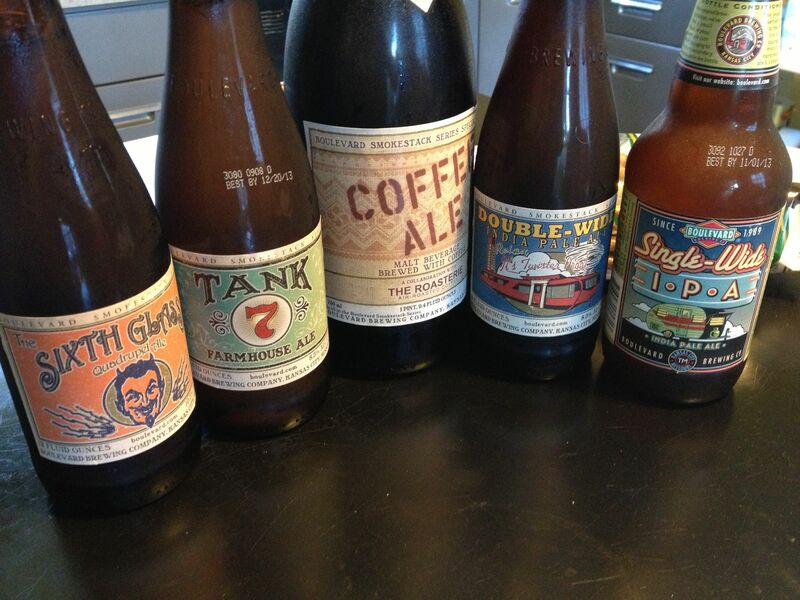 Their Tank 7 and The Sixth Glass are common sights on the shelves of many local beer stores, so we grabbed a bottle of each, and found a few others, and set out for a celebration of Missouri. We started the evening off with Tank 7, a Saison, or Farmhouse Ale. In the glass, this beer was slightly cloudy, with a nice pale straw color. It just called out as light and refreshing, with its Amarillo hops exuding a nice, citrus aroma. The taste of this beer, slightly bitter with a dry finish, was well loved by everyone at the tasting party. While not the best Saison I have ever had, it sure is up their in the rankings, making this a beer I would come back to again. After the Tank 7, we switched to a beer named The Sixth Glass, named after a Hans Christian Anderson Story. The sixth glass! In that sits Satan himself—a well-dressed, conversable, lively, fascinating little man—who never contradicts you, allows that you are always in the right—in fact, seems quite to adopt all your opinions. 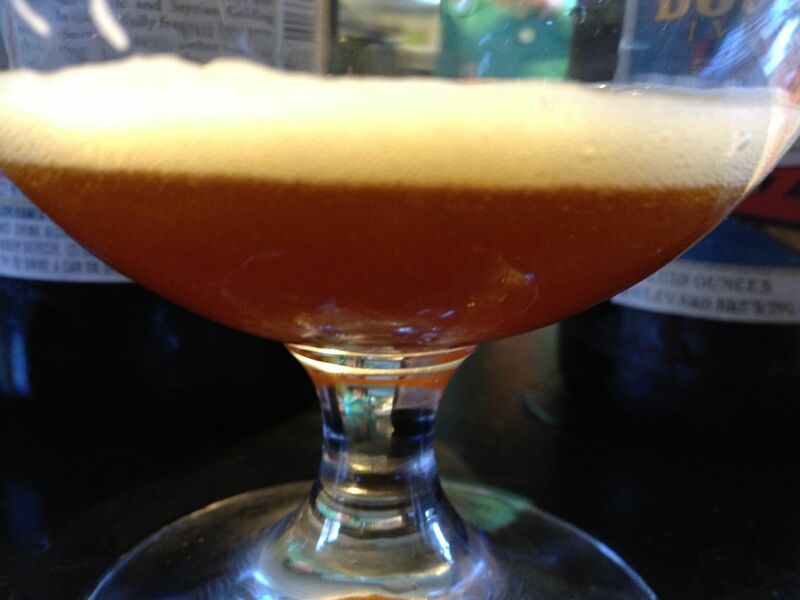 In the glass, The Sixth Glass looked beautiful, with its frothy head, and nice, caramel color. The aroma of this beer was sweet and fruity, with a slight burnt smell. While this beer presented well across the group, the taste was not enjoyed as much. Two of the four people participating, opted out of finishing this beer. One taster even went so far as calling it flabby. From The Sixth Glass, we moved into the IPAs, the first being Boulevard’s Single Wide. Containing six varieties of hops, this beer has a lot going on. Each taster got a different aroma profile from this beer. Some picking up the citrus aromas of the Cascade hops, while others quickly detected the piney aromas of the Simcoe hops. In the glass, this beer has a nice, pale gold color with a bubbly, carbonated body. The aftertaste of this beer was clearly hops, which was expected given the number of varieties used in this brew. Overall, this beer was well liked. The next beer of the evening was another IPA, this one called Double Wide. A Double IPA, we expected the hops in this beer to come off much stronger than the Single Wide. However we were wrong in that assumption. This beer, also brewed with 5 different varieties of hops, was darker than the Single Wide. And that darker color came through in the flavor as well, dampening the hops, and letting the malty caramel flavors come forward. In an IPA, I prefer hops, from start to finish. So with this beer, it was unexpected to have the more caramel malt taste dominate the palate. In that respect, I didn’t enjoy this beer as much as the Single Wide. The final beer of the night was a Coffee Ale. A limited release beer, this brew joins the ranks of the coffee beers that have been one of the pleasant surprises of this project. We have been surprised at the number of beer / coffee collaborations we have encountered this year, with each one presenting a unique character. The Coffee Ale was no different. 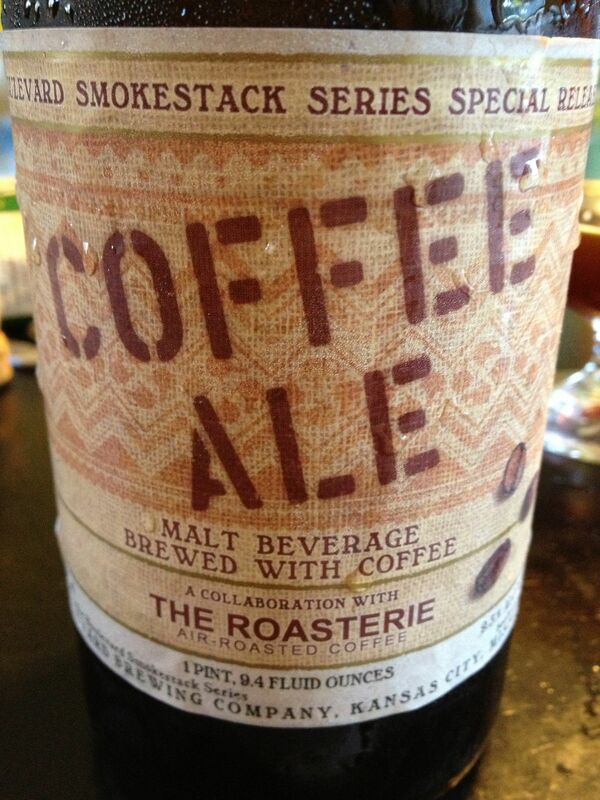 As with all of the coffee beers we have sampled this year, this beer has a nice spicy, coffee aroma. Everyone loved this beer. It tastes just like coffee! and it quickly generated ideas for recipes. This would make a great Red-eye gravy! In the end, this was another well loved beer, rounding out another great tasting week. Thanks Boulevard, and Missouri for keeping the craft beer tradition alive.